Join Panorama Mountain Resort Staff in Celebrating the New Year with Fireworks & Torchlight Parade! It’s a Panorama tradition to stand out on the snow and cheer as the Ski & Ride team and a bunch of volunteers glide down the slopes with torches ablaze. 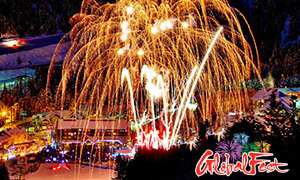 Then the crew from Globalfest will kick off a stunning display of fireworks to really get you into the party spirit. If you would like to join in the torchlight parade, please visit the Ski & Ride Desk in Ski Tip Lodge. Parade begins at 8:50 PM and the fireworks start at 9 PM.